With less than 2 weeks remaining to comment on new badger culling license applications in Gloucestershire, Wiltshire, Somerset and Dorset we repeat some of a post we published last month regarding hunts and the cull zones. How can culling continue to be licensed when there are so many biosecurity breaches in current and future cull areas, when badgers are being disturbed and increased perturbation risked, when people, hunt hounds and vehicles are traipsing around the countryside from farm to farm, badger sett to farmyards, back to setts, through fields of animals and back to farms? 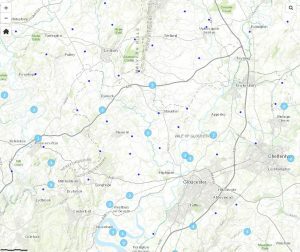 The interactive map commissioned by DEFRA and the Welsh Government shows areas where bTB has been found in cattle. Roger Warner’s beef farm in Tirley is a meet for the Ledbury Hunt… at the end of season meet two years ago a fox was marked to ground in a badger sett by the hounds – the sett was then blocked by terriermen and supporters. This was the last bit of the day before the hunt packed up at Townstreet Farm, supporters heading back there for drinks and a social. The pictures shared here are of the map… we have only chosen a few examples of areas. We are not saying that the hunts are responsible for the spread of bTB to these areas, but are questioning how they are still being welcomed into these areas, especially when they are blocking setts and running foxes to ground in them on a regular basis. 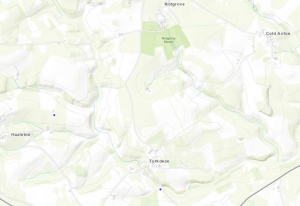 This first picture is of the Gloucestershire cull zone and its surroundings. The Cotswold Vale Farmers’ Hunt, the Ledbury Hunt and the Ross Harriers all operate within large parts of it. Each of them has been caught marking foxes to ground in setts, digging them out or blocking them (the CVFH do not seem to block setts, but the terriermen were caught by a sab at a sett on Boxing Day). 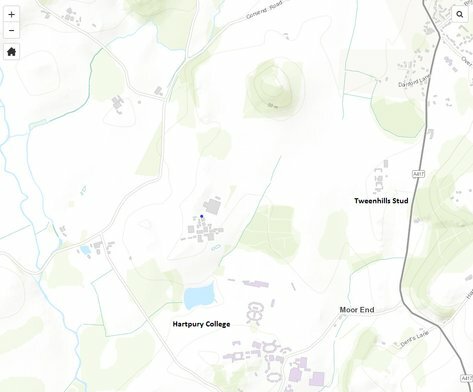 The second picture shows an area in Hartpury where Hartpury College is marked with a blue dot, indicating an outbreak of bTB within the last few years. We have marked Tweenhills Farm and Stud on the map nearby which is owned by David Redvers, a Master of the Ledbury Hunt and is used as a meet for the hunt throughout the hunting season. Within this same area there are 5 separate badger setts which have been blocked time and time again. Within the Gloucestershire zone sett blocking has decreased somewhat over the last few years due to the higher number of people checking setts and the awareness raised in the area of these activities. However sett-blocking does still occur and a back-filled dig-out site has also been found in onoe area which we believe is from earlier this season. One of the 5 setts was almost destroyed earlier this season too and struggled to recover. The third picture is of the Malvern Hills. 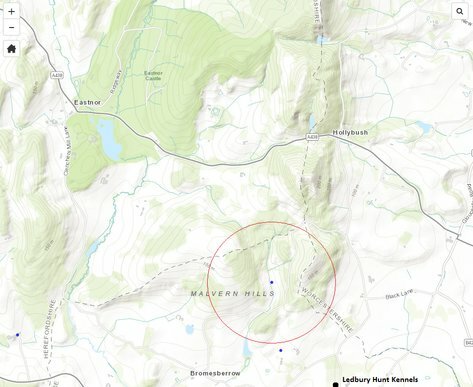 Within the radius drawn on to the map around the blue bTB dot is a badger sett which was dug out by the hunt during cubbing this season and which has been repeatedly blocked by the hunt presumably over the years as well as this season – it will be monitored more regularly now that we know of its presence. The owner of the land also hosts hunt meets on his estate nearby. 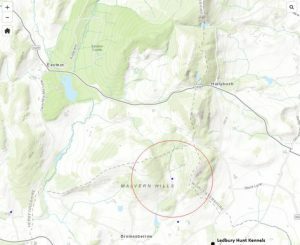 Just as worrying are the reports that we receive about Eastnor Castle and the behaviour of gamekeepers there… even the huntsman of the Ledbury Hunt (whose kennels are to the south of this part of the map) has told us that all of the badgers have been killed or moved on from around the Castle. Picture number four shows an area near to Stow-on-the-Wold where we visited the Heythrop Hunt last month and where we found 9 blocked setts which had either been blocked the night before or on the morning of the hunt meet. This was the day we filmed a fox being chased with hounds just a few seconds behind him. 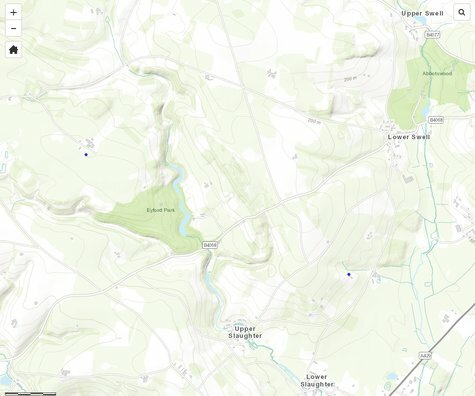 The map shows 2 blue dots indicating bTB presence. Lastly, a picture of the Cold Aston / Hazelton / Turkdean area which we have been in on numerous occasions. 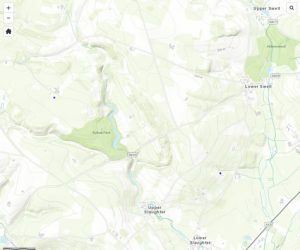 The Heythrop Hunt and the Cotswold both hunt in this area and on one occasion in December of this season both hunts blocked the same setts just a week apart from each other. On another occasion the Heythrop Hunt, the Cotswold Hunt and the Dummer Beagles all hunted this srea within the same week, within the same 5-day period. The Heythrop and Cotswold both blocked badger setts during that week. 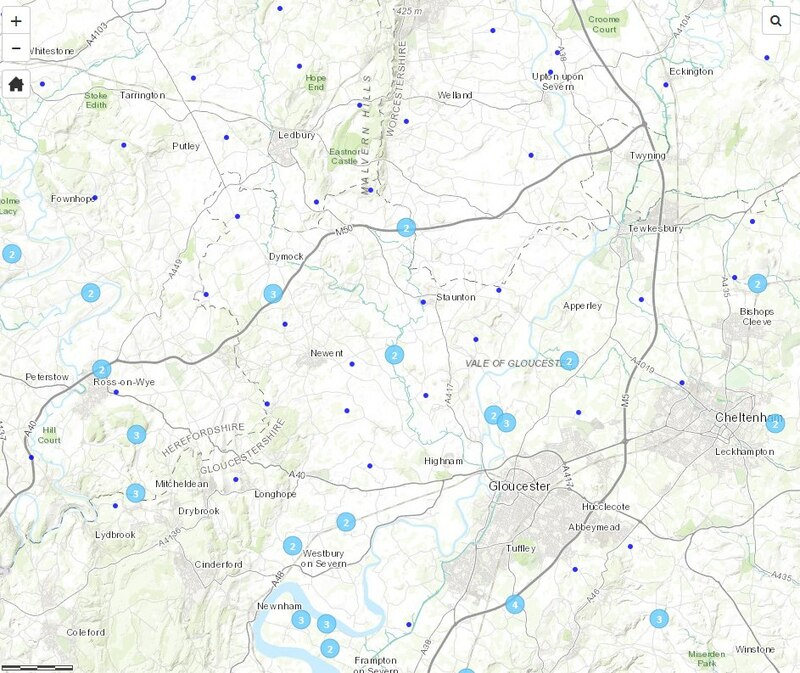 These last 2 pictures show areas within the North Cotswolds part of the Gloucestershire cull zones. Additionally, hounds are fed fallen stock and slaughterhouse by-products, none of which is tested for bTB and which is suspected to be the cause of the outbreak of bTB in the Kimblewick Hunt hounds in February. Hounds “empty” themselves where and when they want and no one really cleans it up. They also run directly over farmland and through herds of cattle and sheep, through fields spread with slurry and have even been rescued from slurry pits before running on. Horses and quads can turn fields into quagmires when there are wet conditions and potentially carry infection from one farm to another. A fantastic day out at the vegan fair on Saturday run by Worcester Vegans & Veggies. 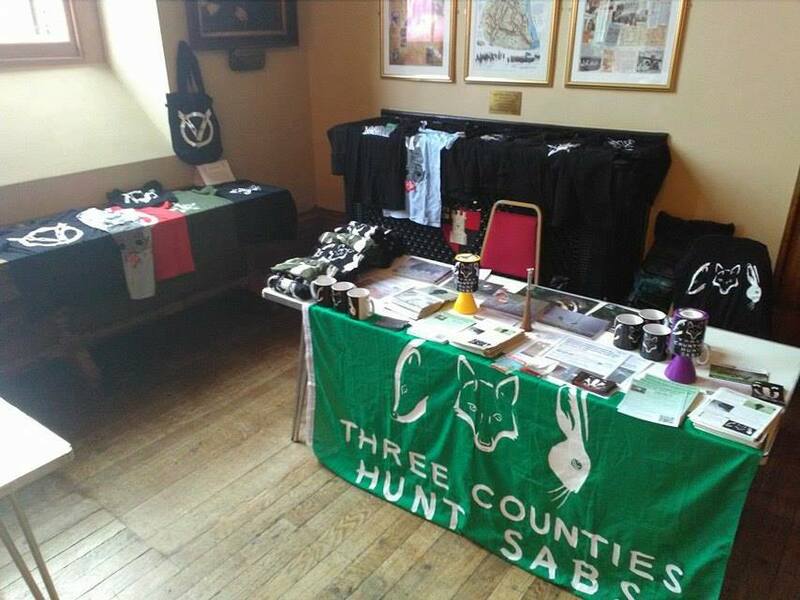 We decided to pay that little bit extra and have a stall in the main hall this year and it certainly paid off to do so, especially as we were in a corner where we could display more merchandise and leaflets without encroaching on anyone else. A huge thank you to the organisers and to the lovely Sea Shepherdvolunteer who helped us out on the day with transport as well as the Vegan Cakery and other stall-holders who help make our day. There was a lot of interest in many of the campaign stalls, including ours, which is great to see, lots of questions and ideas and people wishing to get more involved in different ways as well as donating and buying merchandise. Huge thanks to Black Badger Printworks who had given us a load of stock that needed clearing as it helped raise funds and we were glad to be able to make a little bit of money for our sab friends in North Shropshire as well as Gloucestershire Badger Office especially with sett-surveying getting back into full swing now that the hunting season is drawing to a close. Also a massive thanks to Cirencester Illegal Hunt Watch who some of our sabs joined up with to visit the VWH on Saturday for their last meet of the season. Fantastic teamwork on the day (see separate report for details). All in all, a busy but successful day all round. 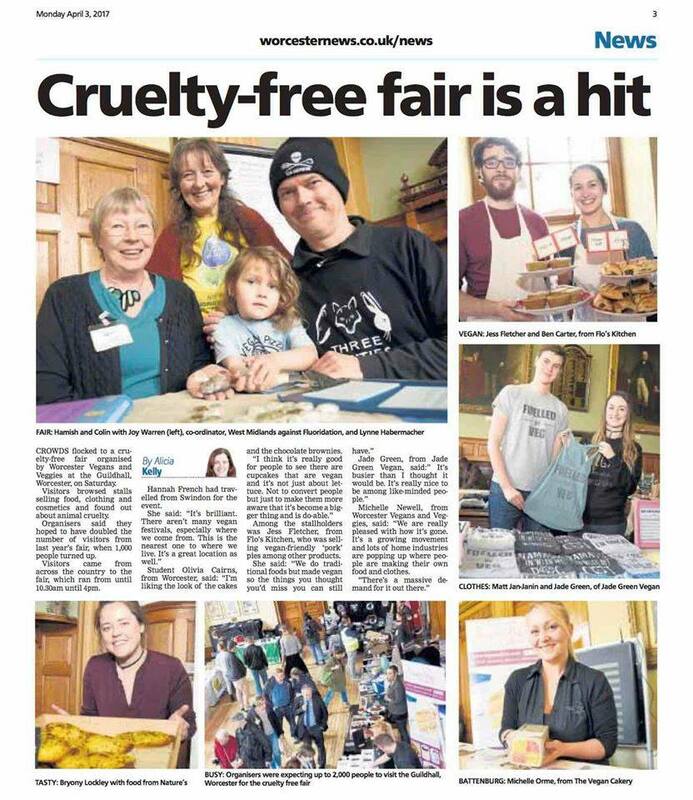 We’ll be at the Cheltenham Vegan Fairlater in the year and will post about our other upcoming fairs and workshops as and when, so keep checking out our page. The VWH had killed one fox, been stopped from hunting another by sabs and then were stopped from hunting this one. The hounds were called off by the staff when we made it clear we were there.By the way the VWH finish well into April meaining that any lactating vixen killed will leave behind cubs who starve to death. Cirencester Illegal Hunt Watch recieved info that the VWH were abound so we scrambled out to help them. We found the hunt at 10 rides in Cirecester Park second horsing at 14.00. They then went down Overley ride and picked up a fox that they then hunted for some hours on a circular route. At one stage a fox was seen to flop down on a track in front of one sab on the Dalingworth ride. Hounds were stopped for some minutes when they came after him with the use of citronella and voice calls (as seen on the video). The pack was lifted away from sabs by the huntsman and we believe that maybe another fox/maybe the same one crossed into Overley wood where hounds were stopped by CIHW using a gizmo and citronella. Sadly though they were hunting until 18.45 going into the polo grounds and we do not know the final outcome of the fox or foxes concerned. As the season winds down the CVFH are having their closing meet today. In amongst this lot is a hound called Dutch man. Dutch man has decimated several hot dogs and sausage rolls with one tray expertly overturned and the pack gobbling up the contents. We were out yesterday and on Saturday with other groups. Reports to follow. Not long now till the season is completely finished in this part of the world…. Mussell’s End Farm, Sandhurst, Gloucestershire cull zone. And so the final meet of the season for the Cottie Vale, and Simon French is off to pastures new. This was an area that was busy during the badger cull but hey ho why not unleash a load of hounds all over the place… and a few horses as well. Ben Hughes (terrierman and cage trapper) was doing well out of the cull but today the lads didn’t seem to be up to much except discussing politics, deer were put up and one little roe deer swam across a pond when he was frightened by hounds. A fox did get hunted from a covert near the river and circled back, they did come back with the pack but abandoned hunting him when they saw sabs with cameras. Long day finishing at 16.50. In other news we were also out on Saturday with Welsh Borders sabs with the CVFH at Coombe Hill, also in the Gloucestershire cull zone. Nothing exciting to report from the day. On Monday we went to Dorset with Cirencester Illegal Hunt Watch to join our good freinds Dorset Against Blood Sports, monitors and some Dorset hunt sabs at Witchampton where there was a joint meet between the Portman and the Beaufort… also a cull zone… with lots and lots of horses and quads. Charlie Framton (who was Portman based but is now master and huntsman of the Heythrop) was also out and had lost his horse. Lots of fox hunting happens in the various cull zones, research as to if and how this could spread tb is urgently needed. It is bizarre that someone vaccinating badgers has to disinfect themselves and all equipment whilst hunts do not have to do the same even when they visit the same area. As a sab group we operate across what are now 3 badger cull zones which includes the whole of the Gloucestershire zone, the whole of the North Cotswolds zone and the southermost part of the Herefordshire zone. The packs we sab also extend into other possible future zones including West Herefordshire, Worcestershire and parts of Oxfordshire. We also assist Cirencester Illegal Hunt Watch across the Cotswolds. Along with other groups and individuals we are well placed to bear witness to the fact that hunts continue to hunt foxes in areas where badgers are being culled. In the same fields, woods and maize crops where traps are laid, hunts continue to hunt. The badger culls are in progress at the same time as hunts are cub hunting. In fact traps have been found set to catch badgers during cub hunts as sabs are following hounds. Firstly hounds are fed fallen stock and slaughterhouse bye products none of which is tested. In fact meat from animals with btb has even been found in food fed to humans so it is hardly suprising that BTB infected meat is fed to fox hounds (and probably pets). Hounds “empty” themselves where and when they want and no one really cleans it up. They also run direct over farmland and through herds of cattle and sheep, through fields spread with slurry and have even been rescued from slurry pits before running on. Horses and quads can turn fields into quagmires when there are wet conditions and potentially carry infection from one farm to another. And so if one pack is carrying tb, plenty of opportunity for it to spread in the field, at hound shows, as hounds are drafted from pack to pack etc. Fourthly, foxes and badgers cohabit. IF badgers are a source of infection then are not foxes too? Badger setts are blocked by hunts to stop foxes escaping down them and spoiling the chase. Foxes are dug out of badger setts and setts are routinely blocked but there is no disinfection of equipment, boots, vehicles and so forth. So why are vaccinators required by law to do so? Hunts also build and maintain artificial earths and if not “badger proofed” badgers can colonise them as well, it is of concern that with it being so easy to build an AE that only a fox can get in that so many are built that can also accommodate badgers…..See the Belvoir Weaver article in pictures. Fox hunting and sett blocking in badger cull zones and potential badger cull zones this season 2016-17. A brief look through this season’s badger cull and hunting log shows the following amount of setts blocked and/or dug out. Only setts found freshly blocked i.e on the day or within 48 hours of a hunt meeting in the area are included. This is only the very tip of a very large iceberg and only include what we have been present at ourselves and the groups/individuals we were working with on the day. For this season only. Signs of historical blocking is found at most setts in these areas as are eerie mounds where setts once existed and there are no signs that any badger escaped. NB cub hunting begins (in this area) in late August, fox hunting proper ends in mid March/early April, that’s 7 months worth of sett blocking! – 21st August 2016, badger diggers apprehended by sabs (NOT hunt related). Near Red Marley. – 16th December 2016, Ledbury hunt, 1 blocked sett. – 6th January 2017 Ledbury hunt, 1 blocked sett. – 3rd February 2017, Ledbury hunt, 1 blocked sett. – 24th October 2016, North Cotswold Hunt, dig out at badger sett. – 19th November 2016, North Cotswold Hunt, 2 blocked setts. 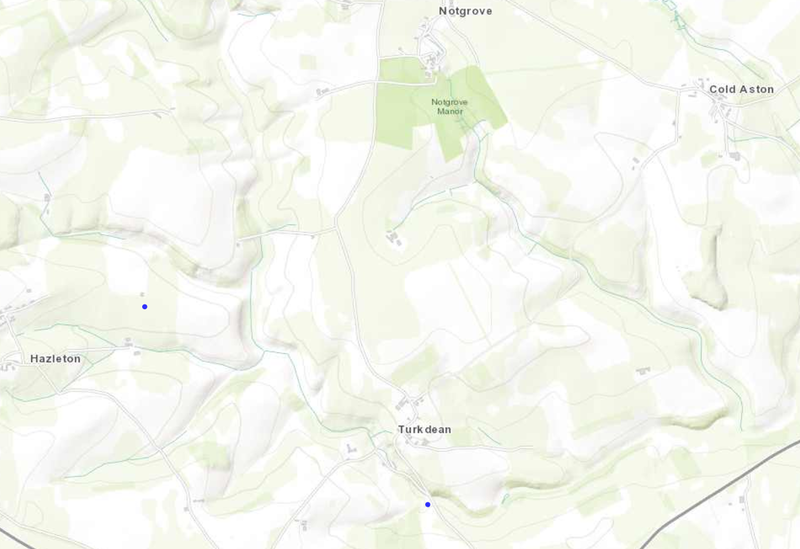 – 3rd December, Heythrop, 5 blocked setts. – 8th December 2016, Cotswold Hunt, 1 blocked sett. – 10th December 2016, Cotswold Hunt, 2 blocked setts. – 28th December 2016, North Cotswold Hunt, 1 blocked sett. – 2nd January 2017, North Cotswold Hunt, 2 blocked setts. – 2nd January 2017, Heythrop, 3 blocked setts. – 14th January 2017, Cotswold Hunt, 2 blocked setts. – 18th January 2017, Cotswold Hunt, 3 blocked setts. 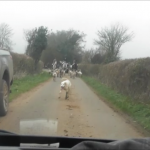 – 26th January 2017, North Cotswold Hunt, sett blocked and dug out. Blood and fox remains found around the sett. – 7th March 2017, Heythrop, 7 blocked setts. (3 different pack of hounds in Turkdean within 5 days). – 11th March 2017, Cotswold Hunt, 3 blocked setts. – 15th March 2017, Heythrop, 9 blocked setts. – 23rd January 2017, Ledbury, sett dug out. 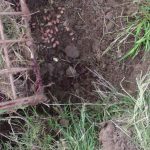 – 17th September 2016, Ledbury, dug out sett. – 11th December 2016, dug out sett, very recent (NOT thought to be Ledbury as no meets that recent). – 28th December 2016, Ledbury, dug out sett. – 20th January 2017, Ledbury, 4 blocked setts. – 29th January 2017, Ledbury, 2 blocked setts. – 10th February 2017, Ledbury, 2 blocked setts. – 6th March 2017, Ledbury, 2 blocked setts. – 10th March 2017, Ledbury, 1 blocked sett. – Boxing Day 2016, Heythrop, 7 blocked setts. – 18th January 2017, Heythrop, 3 blocked setts. Considering that the offcials, staff, supporters and landowners associated with hunts are often the same people who are involved in killing badgers it is incredible that they are not more biosecurity conscious. Or is it that btb is not the reason badgers are being culled?? – The NFU and Natural England profess that badgers spread btb, if this is the case then why are hunts still crossing high risk areas, frequenting badger setts and not cleaning up hound excrement? – What measures are going to be put in place to stop hunts spreading infection? – What research is going to be done regarding possible spread of btb by humans, canines, horses and vehicles? – Why has the criminal persecution of badgers been ignored when targets for culling are set? – What research is being done on the impact of sett blocking/digging on badger populations and perturbation? – We need to protect badgers all year round and collect/collate more evidence on breaches of the 1992 Badger Act. Badger protection is an all year round task and protecting badgers and foxes from sett blocking is just as important as fighting the cull. Sabbing cub hunting and sabbing the cull can be done simultaneously. Data needs to be collated regarding sett blocking across the UK. Saturday 18th March 2017, Beaufort closing meet. We began trying to find the CVFH to no avail and then joined our colleagues at Cirencester Illegal Hunt Watch at the Beaufort who were by then at Hawkesbury Upton. Telescopic Tom from the Bicester was lurking about and at one stage he tried to block in the CIHW vehicle at Manor farm. 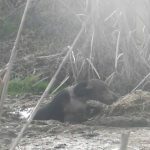 Full report to follow but note the sewage on the hounds legs in the picture. 2. why would a trail layer go through liquid faeces? 3. isn’t this a bit of a biosecurity risk? ‘The first of two videos from 15th March 2017 when the Heythrop Hunt met near to Stow-on-the-Wold… The sett entrances shown in this video are only a few of those we found and unblocked. In total 9 setts were found blocked, many of which had more than 10 entrances. The Heythrop Hunt held their last meet of the season* in Swell Wold, near to Stow-on-the-Wold. They changed their traditional ‘posh day’ to Tuesday instead of Wednesday last season to try and avoid attention from us and the Hunt Monitors but we caught on rather quickly and we heard that their last meet would be held on the traditional Wednesday again. We were out and about very early working alongside locals in the area with our sett-blocking patrols catching a man on a quadbike leaving an area where we were about to check a sett around 5:30am. Perhaps unsurprisingly the tracks from the quad led right to the sett and it was freshly blocked. Elsewhere other patrols heard quads in the vicinity of other known setts and, surprise, surprise, more tracks leading right to and then away from blocked setts. In total we found 9 setts freshly blocked and we gathered evidence of the blocking before removing the obstructions in order to give the badgers a helping hand while providing extra escape routes for hunted foxes. If following a trail, why block setts?? As the Heythrop Hunt have stalkers who follow our every move throughout the day we grabbed some breakfast before they spotted us and one of our group was dropped inland where she knew she could keep an eye on the hunt and on some of the setts which had been blocked to prove that the setts were blocked in areas the hunt would be drawing. Sure enough the hunt drew through and near to the very same coverts and, just after 1pm having drawn blank in a few areas, hounds picked up strongly near to her. The fox leapt a wall and ran uphill and straight past her with hounds just metres behind him, hunt staff and field following around the bottom of the wood and making no attempts to stop the hounds. Fox jinked around in the wood and crossed a fairly fast road into Eyford Park with hounds following close behind… fox had put some more distance between him and them at this point, but we are unsure as to his fate after this fast chase. For legal reasons we are currently only showing the first part of the footage, so watch this space in future. Upon viewing our video online our stalker Lizzie commented that there were only two hounds giving chase and therefore the hunt was legal. It’s good that she confirmed, from a hunt member’s perspective, that they were indeed the Heythrop hounds and they were indeed chasing the fox. She obviously missed the clear third hound in the video and the fact that the fox was being chased down a field and into a wood… For it to be legal hunting a fox can be flushed by two hounds to a gun… flushing is being chased OUT of an area. Not into one. 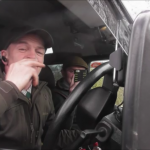 It was clear by now that the hunt were likely to cause trouble on the roads considering their lack of concern for members of the public and their own hounds when crossing over into Eyford Park. Foot sab crossed over behind them and went inland in Eyford and, just after the hunt second-horsed near Kineton Hill, hounds started to pick up again and move towards her. A fox sprinted up a hedgeline away from the covert where the hounds were speaking and tried to go to ground in what looked like an old sett entrance, now taken over by rabbits, which had had a slab of rock shoved into the middle of it which stopped him making his escape there. A hunt rider holloa’d from a nearby field and huntsman began to bring hounds in that direction. Fox, meanwhile, made a run for it across fairly open land so the sun and warmth of the day would have been an extra help in reducing the scent left behind. Around 5 quad bikes at this time were asked to follow our inland sab and she was swiftly asked to leave the land. As the Heythrop are scared to be caught illegally hunting (again) they tend to leave foxes alone when they know we have them on camera so she asked terrierman to pass on the message that she had fox and holloa on film (you know, just so that huntsman didn’t ‘accidentally’ give chase thinking it was one of those elusive trails…). He refused, but huntsman moved away from the area with pack tightly grouped and soon left Eyford Park itself. Some strange incidents of road rage (between members of the public and hunt supporters) and a very odd, and insulting, racist remark made to another member of our group. The hunt continued to draw and pick up on and off and, as the temperature became cooler and therefore better for scent, hounds picked up during their last draw and chased a fox around land and across the A424 (at rush hour) not far from Stow-on-the-Wold. The pack split and huntsman Charlie Frampton ended up on one side of the road… All we could do (especially when quadbikes were slowing us down) was to stop the car and put hazard lights on in order to warn traffic behind us… Unfortunately our stalker Di Campbell wasn’t so clever or responsible and, with hounds crossing the road ahead, yelled at us that it wasn’t safe to park (?!?) there and did not put her hazard lights on, meaning that fast-moving (and probably fed-up-with-the-hunt members of the public) swerved around the vehicles with no prior warning about the presence of the pack. She was probably too busy beeping her horn to prevent fox from breaking cover and filming with only one hand on the steering wheel to pay much attention to actual road safety issues! When it was mentioned that huntsman was irresposibly calling hounds across the main road, stalkers Lizzie stated ‘how else would you get them across? !’ Hmmm… well 1. You don’t ‘lay a trail’ across the main road 2. You don’t allow hounds to chase a fox across a main road and 3. If you need to cross a main road you gather your pack up on one side and you have people on standby to slow down traffic while you cross at an open and safe point where you will be visible, can move straight to a clear area on the other side of the road at a sensible pace and carry on your way. Surely? No? Then you shouldn’t be in control of a pack of hounds… But we’re not huntsman or whippers-in so what would we know about basic common sense? When police were informed they told us they had already received other reports of the hunt’s behaviour, so we will be following this up. With blocked setts, fox chases, holloas and hounds hunting across main roads, we think our evidence clearly shows that the hunt are not actually laying trails. Make up your own minds about it… Here’s the next one of our videos from the day.